The winner and runner-ups of World Mayor 2014 will be chosen based on the number of nominations in relation to the size of their cities and, more importantly, on the persuasiveness and conviction of testimonials received during this year's World Mayor Project. 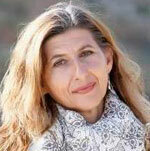 Below we publish a selection of comments received to date about WM nominee Giusy Nicolini, Mayor of Lampedusa, Italy. Comment: Voto la candidatura di Giusi Nicolini a miglior Sindaco del mondo. Comment: I am an Italian citizen and I would like to support the mayor of Lampedusa for the 2014 edition of "World Mayor". I am convinced that she made a great job by facing up the humanitarian emergency arisen in the last years in southern Italy, due to the continuous arrival to the Italian coasts of many boats from Africa. She instisted in considering those people as human beings, and in giving them dignity and attention. At the same time, she tried as well to protect her own island and its population, which also has to coexist with this terrible reality. She is a courageous woman, who put at the first spot values such as solidarity, support, care and attention to those who suffer. Comment: There's one extraordinary good reason to vote for her: Lampedusa is a beautiful and very small island, which in the last years has become the landing place of desperate migrants coming from the poorest countries in the world.